Advanced Micro Devices is building its future server strategy around chips used in smartphones and tablets. The company said its first ARM server processors -- which will be released in the second half of next year -- will be faster and more powerful than its existing low-power x86 server processors. AMD on Tuesday shared initial details on its 64-bit ARM chips, code-named Seattle, which will have up to 16 CPU cores. The chips will be up to four times faster and more power efficient than the quad-core Opteron X-series chips, which draw up to 11 watts of power and are based on the x86 architecture. AMD will sell its first ARM processors alongside x86 server processors, which were also updated with new high-end Opteron chips due next year. 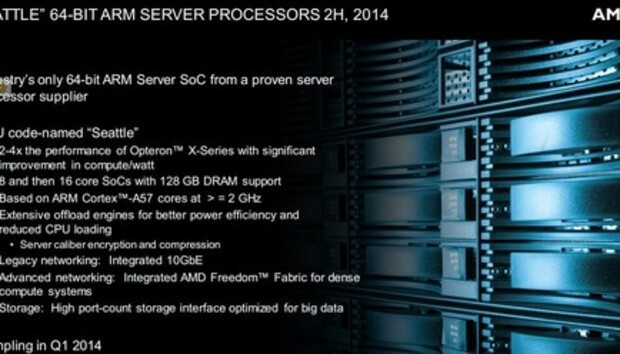 But AMD expects ARM processors to outrun x86 chips in the long term. ARM processors dominate the smartphone and tablet markets today, and have been considered for use in servers processing cloud and Web workloads. Hewlett-Packard and Dell have built prototype servers with low-power ARM cores on which customers can benchmark and test programs. Observers have said the ARM-based chips could give AMD an edge over Intel, and the move could be as significant as its introduction of 64-bit server chips in 2003, and dual-core chips in 2004. Both moves gave AMD a competitive advantage over Intel, but server chip delays and the failure of chips based on the Bulldozer core ultimately cost AMD market share. "ARM servers hit the market for real in 2014, that's the try year," said Andrew Feldman, corporate vice president and general manager of the server business unit at AMD. By 2016 or 2017, ARM CPUs will have 20 percent of the server market, Feldman said. Right now the server market is dominated by Intel's x86 chips, but Feldman said large data centers will start porting software from x86 to ARM in 2015. ARM CPUs, which are cheaper and ship in higher volumes compared to the more expensive x86 chips, will prevail in the end, Feldman said. "In the history of our industry, over the past 40 years, smaller, lower-cost, higher volume CPUs have always won," Feldman said. AMD has been losing server processor market share to Intel, and its Seattle server chips signify a big change in direction for the company. AMD broke its reliance on the x86 architecture in October last year when it announced that it had licensed ARM's 64-bit architecture and would sell ARM-based server processors next year. AMD's ARM-based server chips will be targeted at single-socket servers and also dense servers like the company's own SeaMicro servers. AMD will start shipping test units of the chips in the first quarter of 2014. The Seattle chips will be based on the Cortex-A57 processor design, which is ARM's first 64-bit chip. AMD's ARM CPU will be part of a chip package that will also include 10-gigabit Ethernet and the Freedom Fabric interconnect, which will connect the server CPU to other components in a server. AMD will compete with chip makers like AppliedMicro and Calxeda, who are pursuing 64-bit ARM server chips. Mitac earlier this month announced a 64-bit ARM server called 7-Star with an AppliedMicro chip. AMD has also taken steps to make software portable between x86 and ARM. It helped establish the HSA (Heterogeneous System Architecture) Foundation, which aims to make applications easily portable across different chip architectures and devices including PCs, game consoles, tablets and smartphones. AMD is also working Facebook's Open Compute Project to develop a common slot for x86 and ARM chips. That specification should make it easier to build servers in which x86 and ARM chips can be swapped. Also coming next year are new low-power x86 Opteron chips code-named Berlin, which will double the performance of existing Opteron X-series chips. The chips will have CPUs based on the new Steamroller architecture, and internal graphics processors will help speed up computing. AMD also updated its high-end server processor roadmap with the next-generation Opteron chip code-named Warsaw, which will be released for two- to four-socket servers in the first quarter next year. Warsaw is faster and more power efficient than existing Opteron 6300 chips, and the new chips can be slotted into existing servers running on latest Opteron processors. Are You Prepared to Deliver a True Omnichannel Experience? Rant: Whatever happened to good customer service?